Many successful marketers today aren’t just crossing items off their to-do lists or using past experiences to know what approaches are successful and unsuccessful. These successful marketers take on the holistic approach. This approach includes building personalized connections by being relational, adapting to the evolution of technology by implementing up-to-date technology into marketing strategies, and utilizing inbound marketing by blogging and using content strategies and social media. 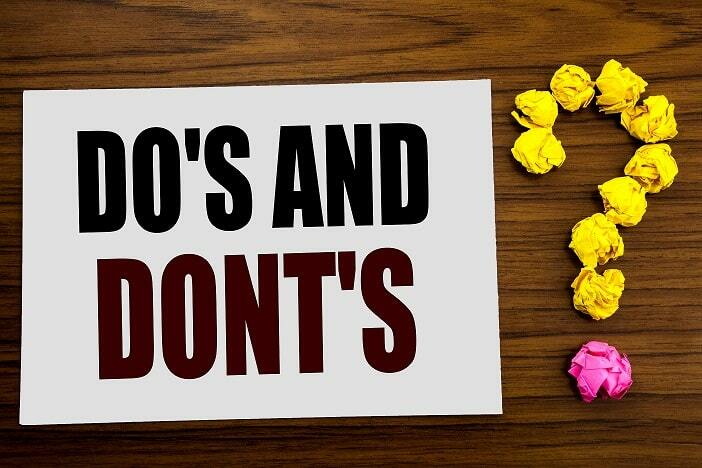 When you are reviewing your current marketing strategies, use these do’s and dont’s as a guide to see whether you are being as successful as you could be. Being successful in standing out with your marketing strategies next to your competition means that you are coming up with ideas that are unique and have not been used before. Being unique isn’t about doing what your competitors are doing and doing it better, but rather, it’s about using fresh ideas and doing something original. Good marketing strategies comes from knowing the customer, the item, or the location on a deeper level. Surface-level marketing is too broad and having a generalized target market won’t allow you to formulate and build personal connections to what you are marketing and who you are marketing to. Knowing how to respond to failure isn’t the only thing that makes marketing successful. Successful marketers also know how to respond to failure FAST. It isn’t only about the ability to identify the strategies that don’t work, but also the ability to know when to terminate the strategy instead of trying to make it work. Accepting the failure and moving on from it as soon as possible will help you develop new strategies that can be successful as soon as possible. Numbers and analytics are extremely important in analyzing the effectiveness of marketing strategies. All successful marketers pay attention to these numbers and analytics by keeping track of performance metrics. Closely considering this important component of successful marketing will allow you to distinguish what strategies are working as well as what strategies aren’t working. Overall, the conclusions that are made from looking at numbers and analytics will allow you to come up with a better concentration for new marketing strategies to increase your number of successes and decrease your number of failures. Nowadays, social media has become the key to successful marketing because it is used on a day-to-day basis by many individuals. Social media has become a perfect place to be creative with interesting and original content to attract individuals to your platforms and overall gain more presence on social media. Because of how important social media has become for successful marketing, it is also important to maintain a schedule for regular posting so that you can remain present and relevant. It is easy to be too focused on the numbers and the analytics that come from the content. Keep in mind that you should be paying close attention to the content as much as you are with the numbers and analytics. It is easy to get caught up in success from the past, so one of the most important things to not do is to never settle for less. Make sure you are always going out of your way to seek the best strategies to get the best results. Any success should be taken as a reason to accelerate the intensity in your marketing, not as a reason to linger with old strategies. It may be difficult to continually go from strategy-to-strategy and get caught up in past failures and successes, but our marketing experts are happy to help guide you through the tricky process and help you be successful with your marketing strategies. Click here to contact the marketing experts at Cuselleration today!